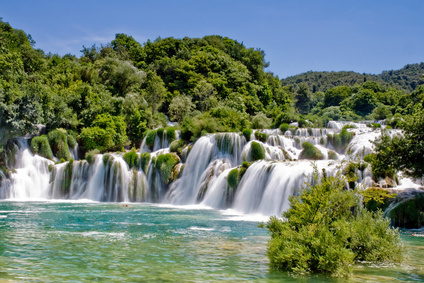 Krka National Park is the second most visited national park in Croatia. The park encompasses almost the entire Krka river, following it from its source at the bottom of Dinara mountain towards its mouth on the coast, in the town of Sibenik. Various tour operators offer guides through the park, but you can also take it upon your own shoulders to explore. The most popular route is to leave from Skradin on the tour boat which leaves regularly throughout the day. After a short journey taking in the sights of the park, keeping your eyes peeled for any number of bird species found around the park, the boat will deposit you in an area with a tour hut and walkways. 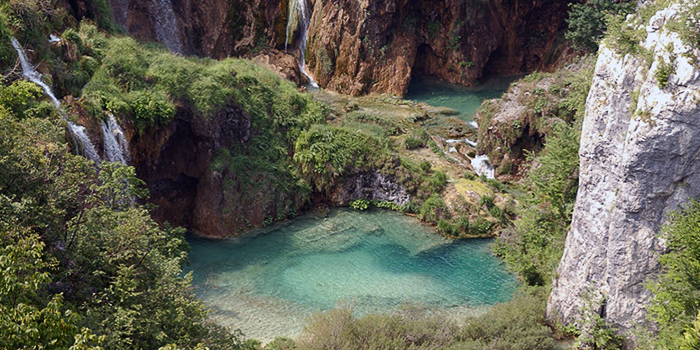 From the trees will emerge the iconic Krka Skradinski buk waterfalls (pictured above.) You can swim here, but like we said – it can be chilly! Plitvice Lakes National Park is the number one most visited park in Croatia. It’s a UNESCO world heritage site since 1979 and boasts a massive 300km of interconnecting lakes, waterfalls and rivers. The magic of Plitvice is that it’s forever changing. Due to the limestone rock formations underneath the streams of water, the lakes and pools at Plitvice change over time through the process of calcification and erosion. There are 1,200 plant species belonging to 112 plant families, making the Plitvice Lakes National Park one of the most important sites of flora in Europe and the world. Many of the plant species are endemic to the Plitvice Lakes park. The most iconic image of Plitvice Lakes are its waterfalls, but also the presence of brown bears. There are also other rare animals at Plitvice, including lynxes, red deer and wolves. 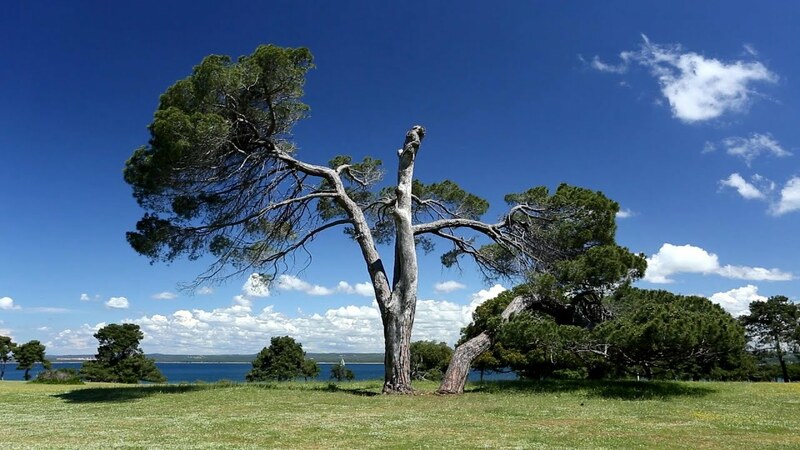 Brijuni national park is comprised of a series of 2 main islands and 12 smaller islets on the Croatian Istrian coast. Originally home to Roman villas, emptied by a plague of malaria and then re-inhabited by the upper classes of subsequently Venice, Vienna & Yugoslavia, the Brijuni islands have seen a vast and varied past. Now, the landscapes are beautiful, the fauna & flora is varied and exploring the islands feels like you’re on another planet, not just a short journey by boat from Pula, one of Croatia’s finest cities. Many animals were introduced to the Brijuni islands & have helped to establish the importance of these islands. Due to the ideal microclimate, these animal species have thrived. There are fallow deer, mouflon and European hares that have all succeeded on the Veliki Brijun, the largest island. Veliki Brijun also boasts a safari park. Over the centuries many exotic animals were gifted from diplomatic partners.You can find elephants (just one African elephant, actually! ), zebras and water-buck. Beneath the waves, there’s a range of life, too. You can find the protected species of clams the pen-shell and the date-shell, as well as the odd dolphin, turtles and some endemic species of plant-life. 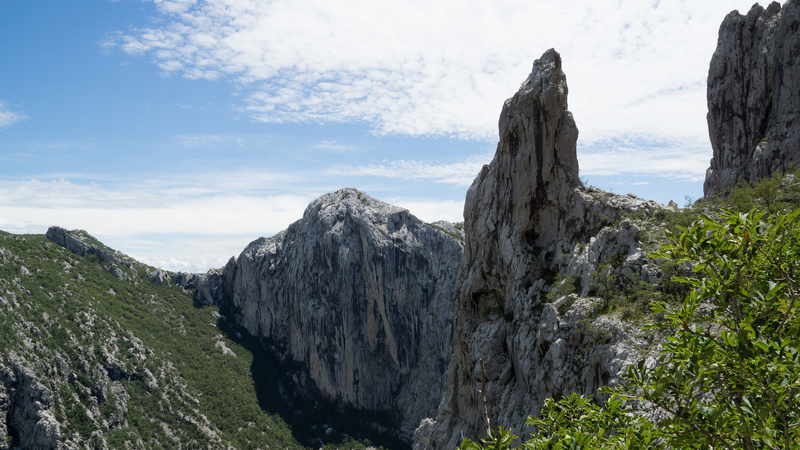 Located in northern Dalmatia not far from the city of Zadar, Paklenica National Park is a mountainous national park with many opportunities for hiking and climbing. The two impressive canyons – which used to be home to roaring rivers – are called Velika (big) Paklenica & Mala (small) Paklenica. Small streams still run here and there through the rocks. There are even mineral springs of high-quality drinking water located throughout the park. There are various caves, pits, ridges, hidden streams and sheer rock faces waiting to be explored. This harsh landscape was used as a backdrop for Hollywood westerns in the 1960s, which should give you an idea of how wild the park is. There are between 150-200km of hiking and climbing trails dotted around the park. If you’re an experienced climber you can head out with your own gear, or if you want a guided excursion there is plenty on offer from nearby Starigrad. We recommend only experienced climbers tackle the routes, whereas the many hiking routes are suitable for various levels of fitness. Look out for the Eagles, snakes and even brown bears! Dubrovnik is an iconic Croatian city. The red-topped roofs, narrow streets and its walls met by the blue Mediterranean have become synonymous with the beauty of Croatia’s Adriatic coast. An ideal city for a romantic getaway, a family adventure or even just to explore by yourself, there is a host of restaurants and bars where you can sample of the famous Croatian seafood or the delicious wines that ooze from the vineyard-perfect hills across Croatia. Split is another top choice. Originally the site of a Roman emperor’s palace, after the empire collapsed a medieval town arose in the old ruins. Now you can live and breathe the history, as the original palace has become the cities gorgeous old town. With bars, restaurants and, during the summer months, some nightlife, Split is again ideal for a family break or with a loved one. From Split you have excellent ferry access to the islands of Brac or Hvar, making Split an ideal base for exploring other beautiful areas along the Croatia coast. There’s even a bus to Krka National Park. Zagreb is Croatia’s capital and most metropolitan city. Street dining, awesome architecture and centuries of history, Zagreb caters to any type of holidaymaker. In comparison to other European capitals, we’d say it was closer to Prague than Berlin, more like Budapest than Rome. It’s a Balkan capital and comes with all the charm. In terms of its attractiveness to tourists, it’s still rather a new phenomenon. 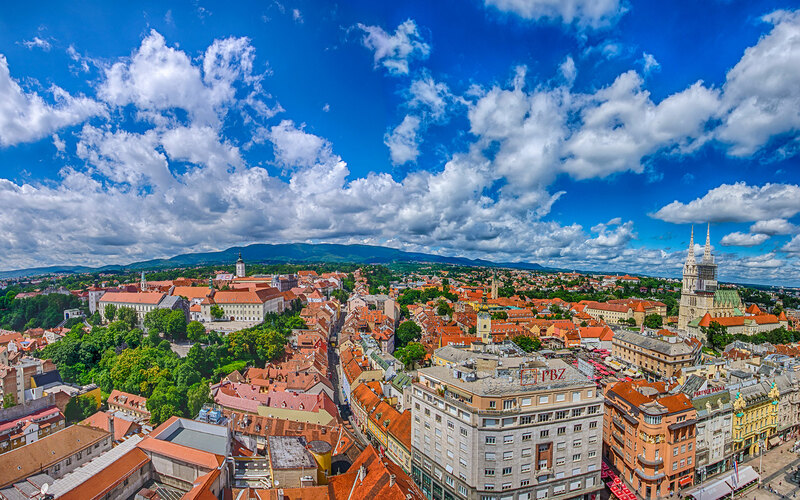 Due to Croatia’s troubled past, the country has really only opened its doors since the early 90s, making Zagreb a top pick if you want to venture into the unexplored. There’s fantastic architecture – like the Opera House pictured to the left – matched with an awesome nightlife. During the day you can explore and during the evening you can wine and dine, usually at half the price of other European destinations. Top pick! The poster beach of all the beaches in Croatia is named Zlatni rat. You would’ve seen this beach before, it really is synonymous with the great beachy offerings Croatia has on its table. This sandy and pebbly beach extends into a turquoise ocean and is lined with a fragrant forest. Popular during the summer months, during off-peak this beach has a different kind of beauty. Surreal and peaceful. 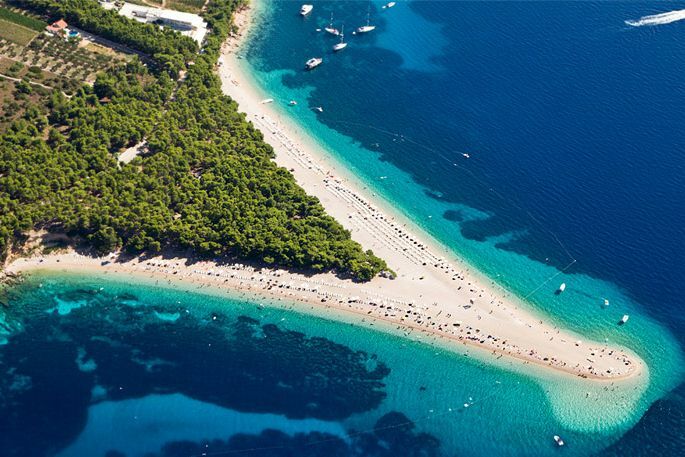 Zlatni rat is located on the island of Bol, which you can reach via ferry from Split. During summer months this is a regular service, and from the harbour, you have to travel across the whole island to the other side to reach the beach. Trust us – it’s worth it! Susak Island is perfect for beaches – why? It is almost entirely lined with sandy shores. This small island is located in the north of the country and is surrounded on all sides by the Mediterranean and sandy beaches. It’s peaceful, underdeveloped and ideal for a relaxing day trip from the mainland or to enjoy a long weekend exploring each and every beach on offer. You can get the ferry from Zadar, or from other locations along the coast. We think the best beach here is Spiaza beach! Kupari is weird and wonderful, in its own way. Originally, the grand hotels here were built during the Yugoslav era and were some of Croatia’s first tourist resorts. During the civil war, the hotels were systematically destroyed with phosphorous bombs. Ever since they have stood as a testament to the former violence. It is an eerie place, but beautiful. The beach itself is gorgeous and you can see why this site was chosen as a place for Croatia’s first beach hotels. This level of history, the abandoned buildings, is something you don’t find along every coastline. Hurry up and visit this summer – there are rumours about a brand new 5 star Marriot hotel going up there within the next few years, demolishing all but one of the original hotels. Rajska plaza – which literally translates as Paradise Beach – is beautiful. Ideal for families or a long day of beach relaxation for a snoozy couple, the water here is very shallow. You can walk out for 1km before you have to worry about treading water. Located on the island of Rab, the best way to get here is on the catamaran from Jadrolinija. There are lots to do on the island, but you’ll probably want to spend a lot of your time at this awesome beach. Staffed by lifeguards and lined with beachside facilities, Rajska plaza also offers a range of water sports. Or…you could just relax in the shallow waters, enjoy the scents of the wooded surroundings and walk out to the small islet located just off the beach.